Gender framing has reared up in the German general election campaign as reported by The Local. 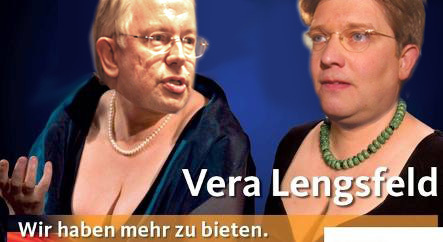 Berlin Candidate for the Christian Democrats Vera Lengsfeld has put up pictures of herself and Angela Merkel both boasting considerable cleavages with the slogan “Wir haben mehr zu bieten” – “We have more to offer”. What the hell is this? Is Lengsfeld incapable of actually putting together some policy statements for her posters? And this is in Germany as well, a country beset by a big gender pay gap, very low birth rates, and poor rights to maternity pay. So I’ve countered with the mockup above, using pictures of Roland Koch and Eckhart von Klaeden instead. Can you imagine a German male (CDU) politician posing for an election poster with a naked torso on a beach or something? I think not, and judging by the waistlines of some of them, it would surely be a gruesome sight. This is all similar in style to Caroline Flint posing in a red dress in the UK, a decision dissected by Mary Honeyball, following on from the Blears-Harman handbag fight. Why oh why do we so easily slip into these gender frames and why, all too often, is it women politicians themselves that are not conscious of what they are doing? German election: a tough night for the left, where now? This was on Women’s hour earlier today, sort of. Don’t get me wrong – I wish politics could be about actually finding out what works best and ideas, but we’re not there yet. I think that when the media no longer uses a woman’s gender as a reason to detract from policies she espouses, and actually listens to what she says rather than taking the worst possible interpretation (loads of examples out there but I was cross about http://www.thesun.co.uk/sol/homepage/news/article327889.ece and http://www.dailymail.co.uk/debate/article-1204657/My-womanifesto-With-Gordon-holiday-Harriet-Harman-launched-anti-male-blitzkrieg–really-like-PM.html), then I think that’s the time at which it becomes unforgivable for a female politician to also play on her gender..
Diese Werbung ist total vorschbar! Yes, perhaps I was wrong to bring in handbag wars – there was a serious point in there. I agree with you Jon – Caroline Flint’s “window-dressing” whinge was totally undermined by her own readiness to sit in the window. But I think you’re wrong to bring the “handbag wars” into it. It was silly that that descended into questions about how much the politicians spent on their own bags, yes. But Harman’s point was a very good one: she was simply trying to draw attention to the problem of inequality as manifested in conspicuous consumption, and to hang her point on a clear image. The fact that she used handbags I think shows no more than that she wants women to exist in our political imagination rather than to be invisible. I suspect she may feel our political thinking and language is all very male. I don’t like blaming “the media” but in this case I think it was journalists rather than politicians who tried to turn it into a “cat-fight” story. Your version of von Klaeden is weirdly convincing. Is it his mum?